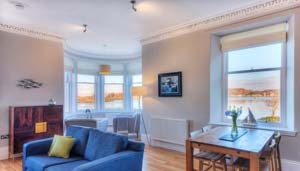 The Turret is located in a spectacular coastal setting on the outskirts of Oban on the west coast of Scotland, a short drive or half hour walk to the centre. The town is arranged around a sheltered bay, busy with ferries and fishing boats, overlooked by the distinctive McCaig's Tower on top of the hill. 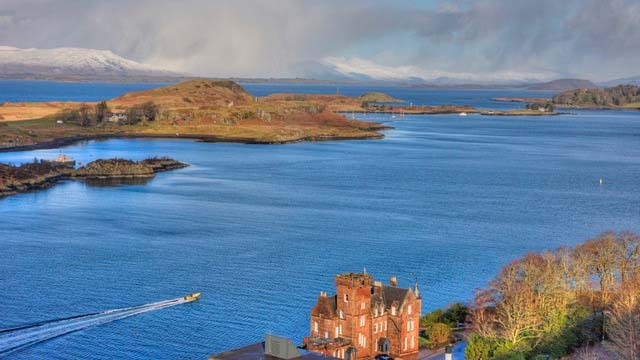 Oban is billed as the Seafood Capital of Scotland, and boasts a number of award-winning restaurants, as well as pier-side seafood stalls and excellent fish and chip shops. Take a day trip to the isle of Mull and its neighbouring small islands – visit the picturesque village of Tobermory, the spiritual abbey on Iona, the stunning rock formations of Fingal’s Cave on Staffa or the puffins on the Treshnish Isles. Follow the James Bond Skyfall driving route through Glencoe and experience the spectacular scenery of the Highlands. Investigate local history - visit the castles of Inveraray, Dunstaffnage, Duart, Kilchurn, Gylen and Castle Stalker, and explore the ancient monuments of Kilmartin Glen, with its numerous standing stones and burial cairns. Experience the beautiful coastal gardens of Argyll for seasonal displays of rhododendrons and azaleas – favourite gardens are Arduaine, Crarae, Kinlochlaich and Ardkinglas. Take advantage of a range of boat trips in the area offering whale-watching, wildlife spotting or the adrenalin thrills of a high-speed rib. Visit the whisky distillery in Oban, one of the smallest and oldest in Scotland. Learn how whisky is produced and sample some of the amber nectar at the end of the tour! Just south of The Turret is the small passenger ferry across to the isle of Kerrara – an excellent walk is around the southern half of this island, with its rocky beaches and stunning sea views, taking in the ruins of Gylen Castle and the quirky Tea Garden. The Turret is located on the first floor of Kilbowie House, situated a mile from the centre of Oban and set in its own grounds by the sea. The building is entered through an impressive timber-panelled hall with an ornate fireplace. There is a grand staircase up to the first floor. Once inside the apartment, there is an entrance hall leading to the living room and bedrooms. The generous open-plan living space includes a corner turret, as well as comfortable sitting and dining areas. Oak flooring makes this a light, airy space, reflecting the shimmer of the sea, and beautifully furnished in soft greys and whites with splashes of colour. 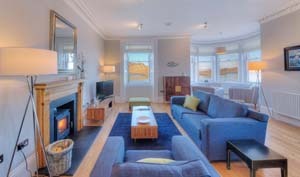 It’s the perfect haven for relaxing days, watching the yachts and ferries sail by, and cosy evenings in front of the woodburning stove. 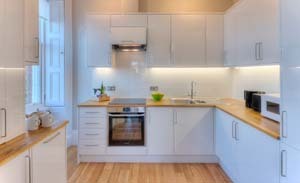 The compact yet well-equipped kitchen contains all you might need to make best use of the fabulous local produce on offer in Oban. 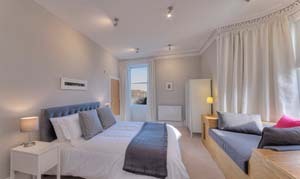 The two luxurious bedrooms are both decorated in calming greys with crisp white linen. 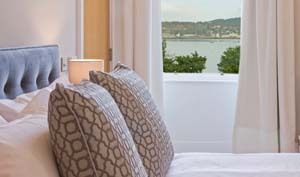 The en-suite master bedroom features an indulgent window seat in the bay window, somewhere to curl up with your favourite book. 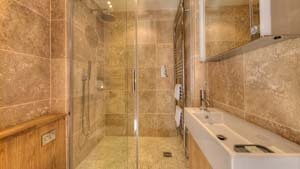 The shower rooms are both decorated to a high standard with walk-in showers. Outside, there is access to a communal garden at the water’s edge, protected by a crenelated stone sea wall. The Turret has one designated parking space. Starting in Oban, proceed through the town, following the signs for the Cal Mac ferry pier (a white ferry on a brown background). Continue driving past the ferry terminal, along Gallanach Road (this becomes single track) for approximately one mile. Turn right into Dungallan Terrace and the entrance to Kilbowie House is immediately on the left. Heating is included, along with a starter pack for the woodburning stove. Change over day is Saturday. Check in 16.00, 10.00 check out. Short stays available in the low season. 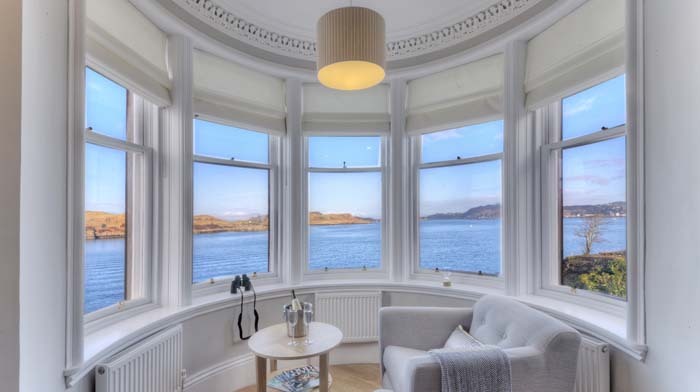 To book this luxury apartment with sea views on the outskirts of Oban, click the enquiry button below and see availability and rental prices. 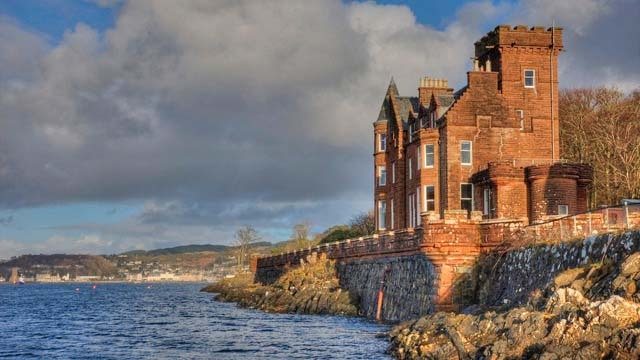 This gorgeous 2 bedroom apartment is on the edge of Oban in a beautiful Victorian mansion house - you can walk to excellent seafood restaurants, pubs and cafes and it's just 30 minutes walk to the centre. The views over the sea are stunning - relax on a chair in the bay window and watch the boats passing by.